My friend Jane and I are always borrowing each others dishes, so when she asked to borrow my cabbage leaf plates in all three colors for a baby shower, I was intrigued! It turned out the theme was Alice in Wonderland! 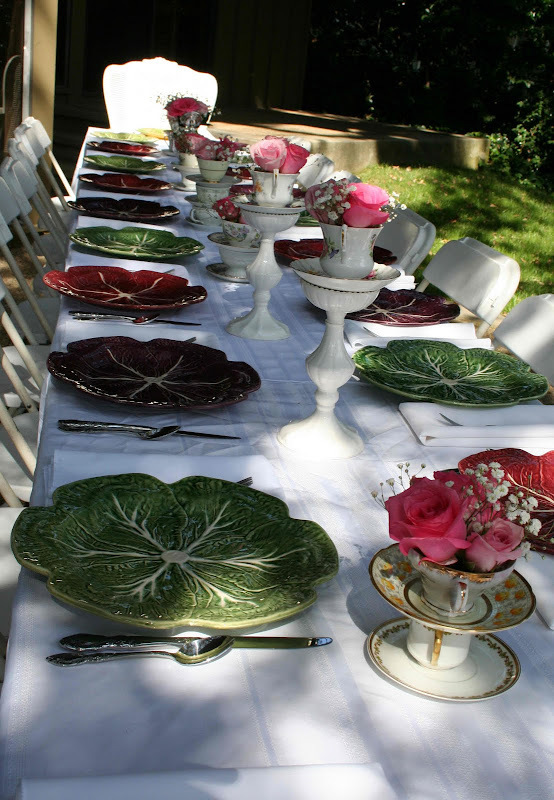 The table was set with my various cabbage leaf plates in green, red and purple for a lovely garden tea in Sacramento, right on the river! 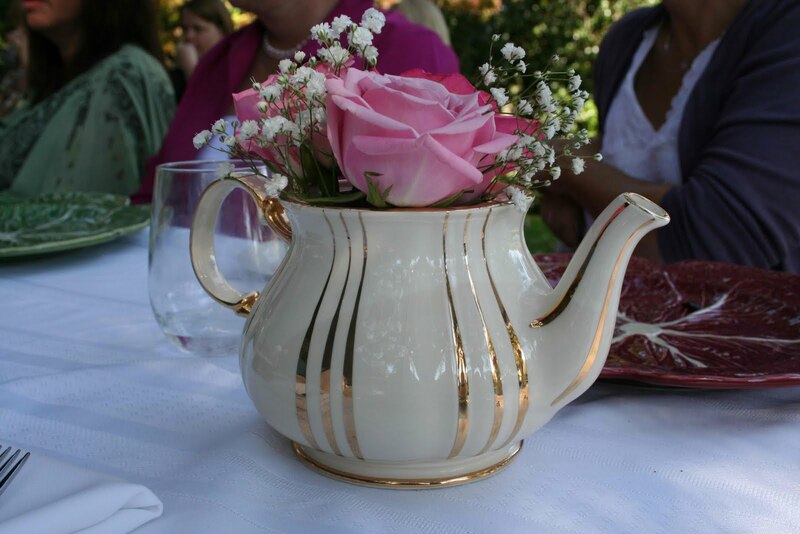 ...along with tea pots full of roses. More stacking cake stands with pastries and roses. I'm so glad the hostess sent me these lovely photos! 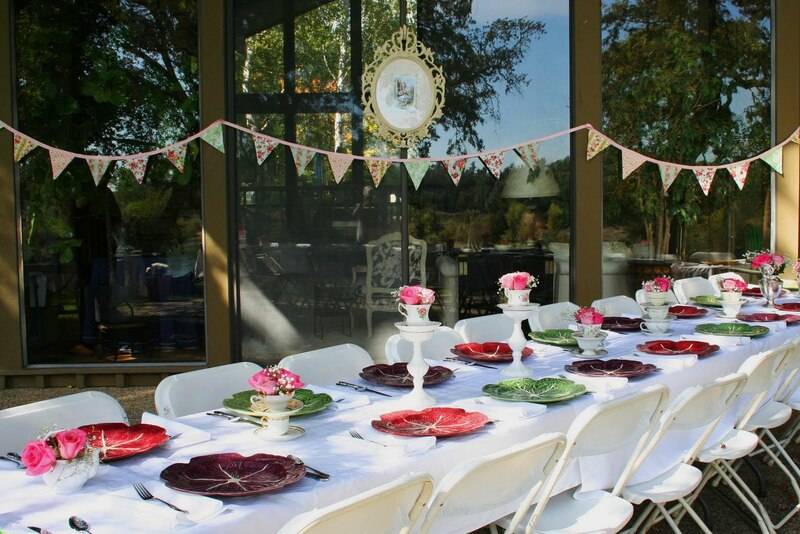 It looks like it was such a gorgeous day and a gorgeous party! What a great theme for a party, I must say! I'm joining Susan at Between Naps on the Porch for Tablescape Thursday. Absolutly gorgeous! 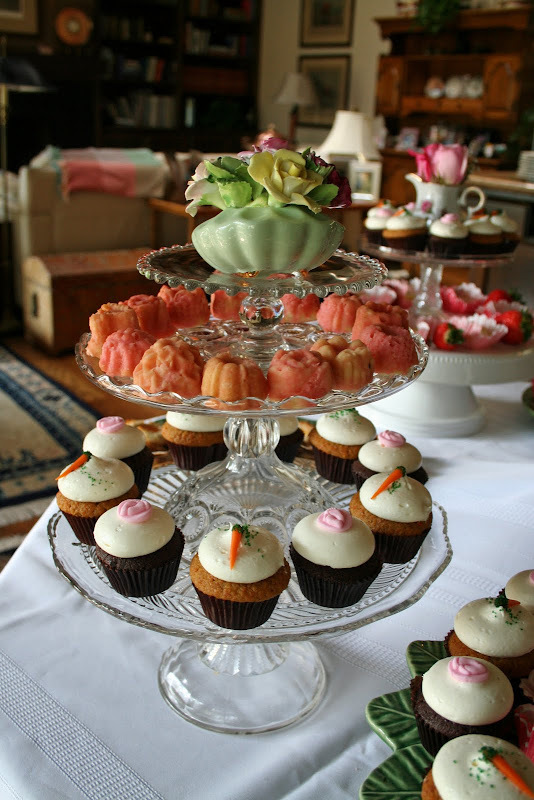 I love the flower filled teacups on top of the candelsticks. I might have to steal that idea. I have a set of the green cabbage plates that I picked up at Marshall's. I love that you mixed them with the pink ones. What an adorable idea for a baby shower. So very creative and the tablesetting is beautiful. Love your cabbage plates. Oh my, I am feeling a spending spree coming on. I am off to ebay to see if I can find those plates. Very sweet,love the plates they add so much to the tablescape...great theme for a shower. What a cute shower! Everything from the dishes to the desserts was well thought out, and I love the invitations, too. What an intriquing theme and the tablescape is magnificantly unique! 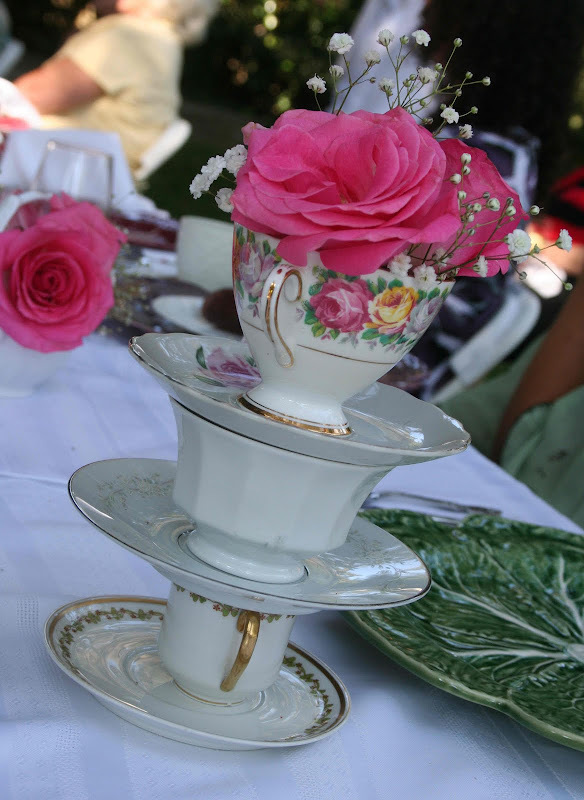 I adore how the tea cups are placed and finished with roses down the length of the table! Your plates were the perfect choice for this setting! All inspiring decor! Thanks for posting these darling photos of the tea party. It was a treat to see the table dressed in teacups and roses with your beautiful cabbage plates! I am certain they ladies had a wonderful time in this lovely setting! I like your favorite "design quote". The older I become, the more I like classic looks. Dropping back by to ogle this some more. I just love how she stacked those cups like on the Hatter's table. So cute, as are the cabage leaf plates. The whole thing. Incredible! I'm intrigued by the fact that she didn't iron the tablecloth. Do you like this "fresh from the linen closet" look? sometimes I think white tablecloths look like my grandmother, so I'm wondering if leaving the creases in is a way to make them look less fussy. 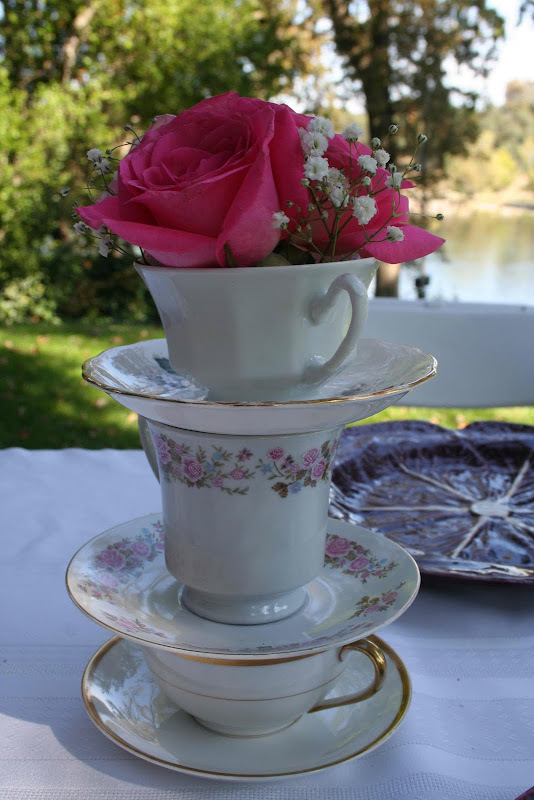 How adorable this table is...love the stacked teacups and the plates are such beautiful colors!! Those desserts have my sweet tooth a-twitter!! What a cute theme! 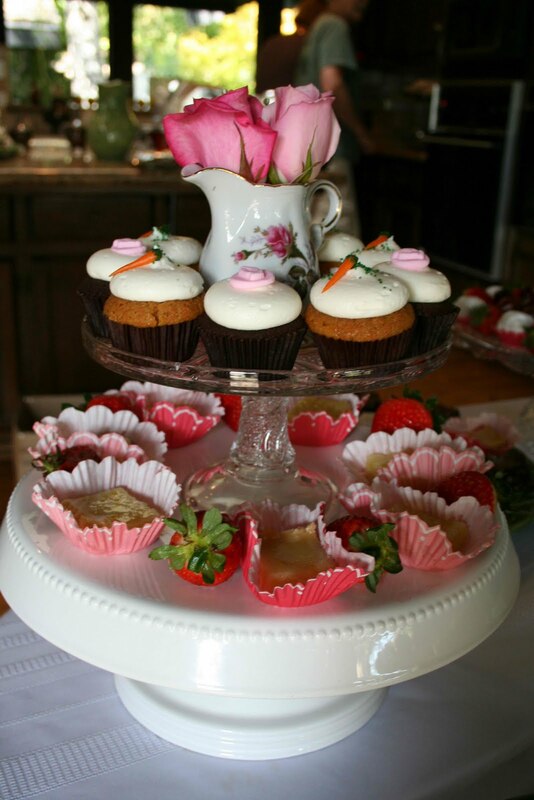 The stacked teacups and roses give the table a very whimsical feel, and those treats look yummy! She has a real talent for laying out a table! the cabbage plates! The pink roses with the white china tops the whole mad party off. I have been even slower than usual getting around to all the posts on TT this week, and I would have just kicked myself over and over again if I had missed this one. This is terrific!!! What a cool theme and what a cool interpretation! Every detail is so fun and PERFECT for a tea party! I love it!